Brazilian version issued in both white & blue style TecToy boxes. 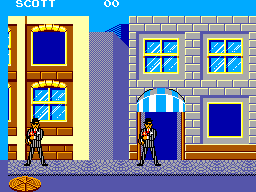 The blue style is a later release and much harder to find than the original. The 'other' in the rarity section of this listing is to indicate this variant. "In the 1920's, working as an FBI agent, you are pursuing a gang engaged in smuggling. 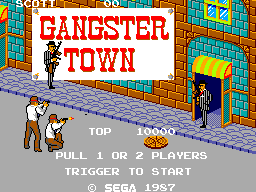 After practicing your markmanship, shoot at the enemies in Car Chase, Downtown, Saloon and Night Club scenes." 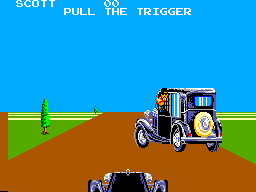 To continue with additional lives wait until the "Game Over" screen. When your character's hat is shot off, shoot it while it's in the air and it will land back on his head, allowing you go try some more from where you left off. It only works once. Manual Scan of the USA manual (by Roth) in .PDF format (Adobe acrobat required to view) 749KB in size.